According to Transparency Market Research (TMR), the global isothermal bags & containers market has fragmented landscape as numerous local and global companies are offering services in the country. Some of the key players operating in the isothermal bags & containers market are Cryopak Europe, Sonoco Products Company, Sofrigam SA Ltd., Pelican Biothermal LLC, va-Q-tec AG, ACH Foam Technologies, LLC, Cold & Co Sprl, Tecnisample s.l., Saeplast Americas Inc., AccsA'tech Medical Systems, Tempack Packaging Solutions, S.L., Advanced Products Portugal, Cold Chain Technologies, Envirotainer Ltd., American Aerogel Corporation, Snyder Industries, Inc., Inno Cool India Private Limited, Insulated Products Corporation, Exeltainer SL and TKT GmbH among others. 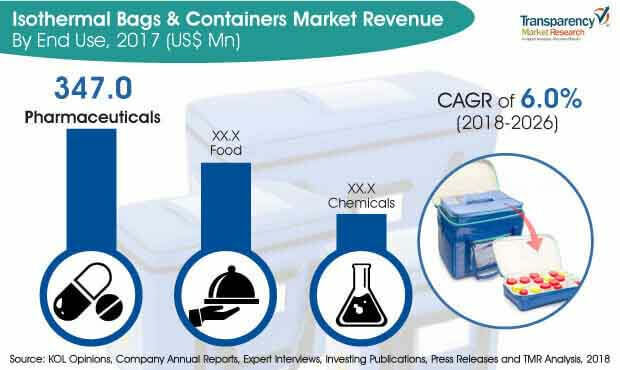 According to a report by Transparency Market Research (TMR), the isothermal bags & containers market is US$ 657.6 Mn in 2017 and is projected to increase at a CAGR of 6.0% during forecast period 2018-2026. The global isothermal bags & containers market has witnessed solid growth during the past few years, owing to growing pharmaceutical and food industries across the globe. The increasing trade for perishable products has given a boost to the isothermal bags & containers market. The global isothermal bags & containers market has witnessed impressive growth in the past few years, due to growing trade across the globe. Growing exports and imports between the countries and safe transportation of products has paved the way for isothermal bags & containers market. A number of other factors are expected to drive the isothermal bags & containers market, such as capability of keeping product fresh and maintain cold chain during transit. Fast growth in organized retail sector, especially in emerging economies, is expected to fuel growth of the isothermal bags & containers market. Despite the positive outlook, there are a number of factors that always leave a space for product damage during the transit, ultimately hampering the growth of the isothermal bags and containers market. Nevertheless, increasing R&D in the field of biotechnology has boosted the demand for appropriate cold chain solutions to transport biological samples such as blood plasma, and serum, among others. Therefore, with advancement in the pharmaceutical sector, as well as the food & beverages industry, the global isothermal bags market is anticipated to face lucrative opportunities for growth, during the forecast period.